Tutor-student field trips do not have to be long or expensive. There are many free opportunities right in the community, like a trip to Wegman’s grocery store. A couple weeks ago my English tutor, Fred, suggested that we could spend some time at Wegman’s instead of our regular English class in a meeting room of his church. Wegman’s at Downingtown,PA is one of the largest grocery stores in Chester county. The store provides not only daily food but also has a Pharmacy and a Market Cafe. For me Wegman’s is the place where I get fresh fruits and organic milk. On Monday, Fred and I started our Wegman’s tour from the cafeteria. Since it was about time for lunch we needed to find something for lunch. We explored the food bar and found a lot of options from oriental to Italian foods, such as dumplings, fried rice, pizza and fresh salad. They all looked delicious! Fred wanted to have a sandwich so he asked a Wegman’s lady behind counter where we could find a sandwich. She showed us where we could find a fresh made sandwich. We walked to the sandwich place and another Wegman’s lady made a tuna wrap for Fred. She asked Fred what he wants in the tuna wrap, such as lettuce, onion and etc. Both ladies were friendly when we spoke with them. After our lunch time we started walking around in the store. I visit this store almost once every week for quick food shopping and never had a chance to explore which I always wanted to try. We found couscous at the natural food section. I had couscous once at a restaurant and loved it every much. It was time to get a bag and cook my own couscous! I like this section because I can not only find something healthy but also get to learn some new ideas. We found mac and cheese when we passed by a shelf with a bunch of boxed food. Fred told me mac and cheese tastes good and his grand children love it. I grabbed one box and want to cook it at home sometime. It was about two hours we stayed at this store. Fred answered a lot of questions when I found something new and asked him what that is. We talked about cooking and food. We had a good time and I bought the bag of couscous and a box of mac and cheese! This kind of class helps me to better understand America and learn more and more about American life. And that is the value of my experience with the Volunteer English Program. Last night my youngest child graduated from High School! It was one of those life moments I will never forget: seeing my “baby” shake hands with the superintendent and turn her tassel on her mortarboard. She has learned so much, worked so hard, and now embarks on her next adventures of college and beyond. The occasion is imprinted in my memory and my heart, yet it was even more special for me in my role as program coordinator here at the Volunteer English Program. 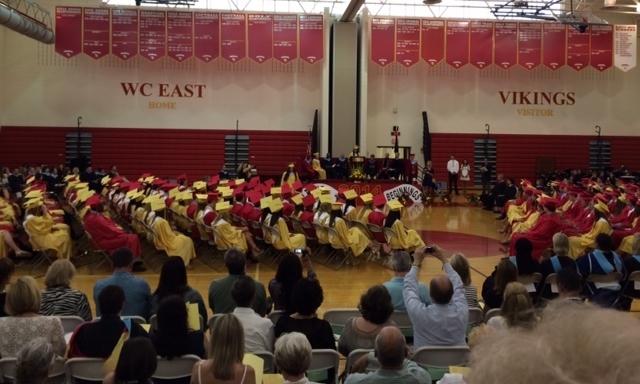 Because seated among the red- and yellow-gowned graduates with my daughter were many children of VEP students and other immigrants. Those parents cried in the audience along with me as they witnessed the event. I was impressed by what this graduation must mean to them. Some parents might have had minimal schooling in their native country. Others who were educated may have left home to offer their family a better life here in the United States. In that moment, watching their first child accept a high school diploma in the United States, part of their dreams must have come true, their sacrifices justified. I saw their families embracing, shedding tears, and even screaming with delight after the ceremony as they celebrated. I value this milestone in my motherhood even more as a result. And I am proud that I live in a community which supports adult ESL education, in which volunteers tutor fellow-parents who want what we all want: to give our children a better life. Congratulations to the Class of 2014 and to ALL of the parents who helped their children succeed. Shannon Almquist is an inspiration. She’s one of those women you could listen to all day, who has met so many fascinating people in her life, and who always gives back to her community and her world. We are fortunate that she is a long-time VEP tutor who has taught five students in our program over the years, in addition to many more she has hosted in her home with her husband Roy, who was pastor at Calvary Lutheran Church. 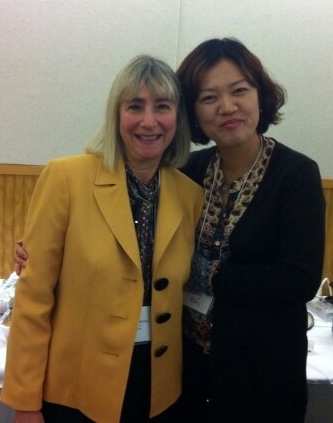 She is also an Educational Consultant who has trained tutors here at VEP and all over the globe. 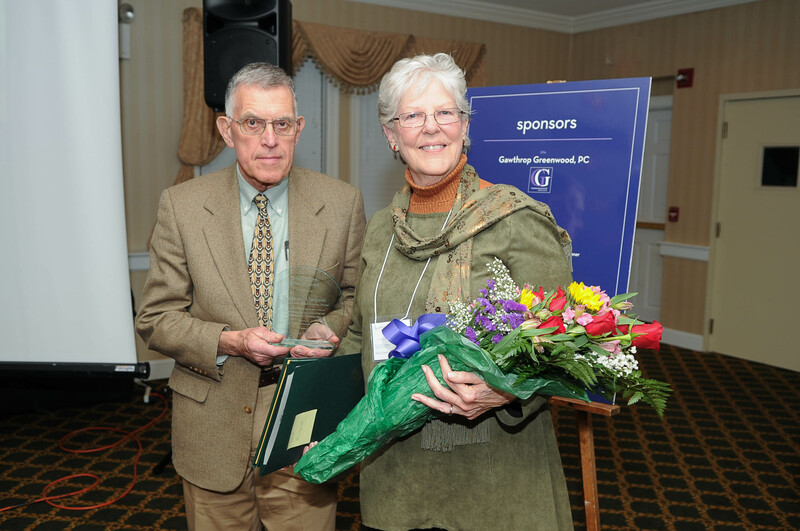 At our recent “Help VEP Bloom” spring fundraiser, Shannon was the recipient of the Betsy Hawkes Award, presented by Bob Hawkes, VEP Sponsor, friend, and husband of the late Betsy Hawkes. Her moving speech follows. Enjoy! “Many, if not most, non profit organizations and charities are the brainchild of one individual. In the case of Volunteer English, it was the vision of June Hamilton to enlist her fellow members of Calvary Lutheran Church in West Chester to aid recent immigrants in learning English, so they could be fully integrated into their chosen communities. Our early materials were Laubach books and curricular materials from the Chester County Library, ones created for missionaries to use in their work in distant places. For an organization to survive, flourish, and grow it must transcend its initial stage. 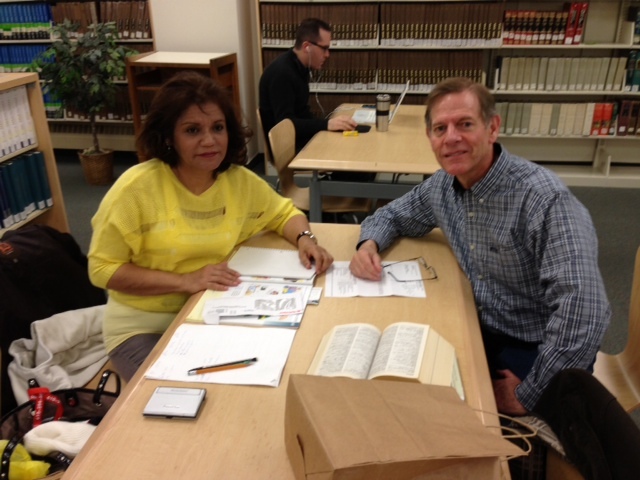 The Volunteer English Program now has almost 200 tutors and is led by professionals. These professionals test each student, determine with them goals and level of English. They train the tutors and match them with appropriate students…it’s come a long way from the “mom and pop” origins. They provide educationally appropriate materials, from newspapers to driver manuals to citizenship application guides. The Board consists of local business and professional leaders who understand how to support and guide the organization and aid in the funding necessary for VEP to survive and thrive. As for my journey, I first had Shan Shan as a student. She had been a Russian professor in China, along with her husband. When the Cultural Revolution determined educated people to be “the enemy,” they and their 2 children were sent to the countryside to be “re-educated,” and their children (along with an entire generation) were denied education. Somewhere Shan Shan heard that in America you could be a life long learner, and she decided she would apply for immigration here and hope to be able to bring her husband and two grown (20 and 22) children to this country. The American dream…that you can be a life long learner. How lucky we are to be able to share and participate in that dream. Since then I have had Marcella from Mexico, Andrea from Hungary, and Toranj and Nasrin from Iran. Nasrin is here this evening with her husband Reza, and she became an American citizen last year. Her boys are at local schools, and the family is thriving. Nasrin is employed by the Chester County Intermediate Unit as a substitute secondary math teacher. She has become a dear friend. Below is a “Wordle” of Shannon’s speech. The Match. The connotation of “match-making” has always been a little bit magical, from back in the day when aunts and friends would thrust a couple into a lifelong marriage, to the tech-happy internet dating sites in today’s world. We make a different type of match at the Volunteer English Program, not a romantic one, yet also based on compatibility. Unlike the old-fashioned match-making, our match begins with a one-hour session to get things off on the right foot, followed by monthly updates, all to encourage success. After we train volunteers from the community to be English tutors, and after students undergo the intake process (see Overcoming Obstacles, Step 1), the VEP staff matches each student with a tutor who has the same time of availability and location. We choose a tutor who might complement the student’s goals, interests, family structure, or ability level. The “jigsaw puzzle” of matching available tutors to waiting students is part science, part art, as we attempt to align as many factors as possible for the pair, to promote longevity and compatibility. And then comes the memorable moment when the two meet here in the VEP office. Irma Pomales-Connors (VEP Program Director) or I sit with the pair for at least an hour, making introductions, planning lessons and reviewing materials, modeling a tutoring session, and practicing techniques that tutors learned in the Tutor Training Workshop. The tutor and student leave here with goals and a game-plan. Both student and tutor are a little bit nervous to meet that first time. We quickly put everyone at ease, asking some questions, modeling the proper speaking speed to accommodate the student’s level. The tutor leans in, completely engaged as the student tells of his/her challenges, obstacles, goals, and dreams — and I can see the student’s whole demeanor relax and open up. Sometimes, the student’s relief is palpable with the realization that a volunteer wants to devote time to help them. Someone who cares! We provide books for the student and the tutor, walking through techniques for using them to teach reading, comprehension, writing, speaking and listening. The tutor practices explaining words and concepts, correcting the student, and leading them through materials. The two ask each other questions, clarify confusing points, and almost invariably, they laugh together at something for the first time. After we have set goals, outlined lesson-plans, chosen the bi-weekly meeting place and times, and exchanged contact information, the match appointment is over. The two will meet on their own somewhere in Chester County now, and we might only see the student occasionally. The tutor will submit a monthly progress report of hours and activities, but the real magic, the countless moments of understanding, instruction, collaboration, all to open opportunities for that student, will happen without us. All because of a magical match. If you would like to experience this new kind of relationship in your life, call us. We have 72 adult immigrants on the student waiting list; one might be the right student for you. “I wanted to get a credit card because I needed to get credit in the United States. If I buy a house and my credit is good, the interest will be lower. In my country I used credit cards so I knew the benefit of a credit card. Sometimes the credit card company returns money for using a credit card. You can get miles or discounts by using the card. Without a major credit card (like Visa, Mastercard, or American Express) I cannot get a store credit card. “First I opened an account at a bank (Wells Fargo). I saved money. I thought that the bank would trust me if my account got higher. I waited about 1 year. After 1 year, I visited the bank and asked them for a credit card. They required information about me and my husband. I gave them information but I was refused. They told me to call to find out the reason I was refused, but my English was not good and I didn’t understand. My VISA was expiring in 6 months, so I thought I will try again after I renew my VISA. The first step is an act of bravery. It starts with a phone call or a visit to our office. 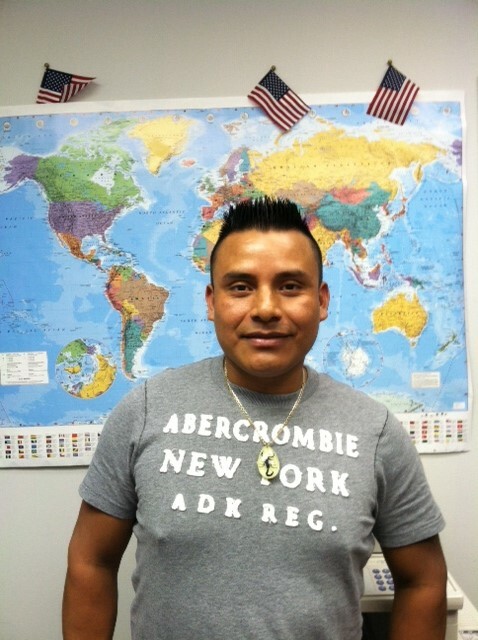 What we call the “student intake” is the process an adult immigrant goes through to become a student with VEP. Others just show up at our door, wide-eyed, apologetic, and visibly nervous, because using the phone is too hard. Many people tell us later, sometimes years later, that the smiling person opening that door gave them courage and hope. We help immediately if possible, or we write an appointment card and point to the calendar. Intake. The word sounds so clinical, but the process is warm and human. We sit with the man or woman and collect a wide array of information. We give a reading test and obtain a writing sample, if the student is capable. But more importantly, we listen to the student, who finds a way to tell us their life story. They open up to us, so desperate for help, when they realize that someone truly hears them and sees them. Many tell of their advanced degrees and education, their jobs as nurses and psychologists, business people and teachers, but here they make a living washing dishes and cutting lawns. Others, barely literate in their native language, have only a few years of elementary school. Each has a spark, a belief that speaking English will help them do better. Others are refugees from war-torn countries, mothers escaping abusive homes, parents who must feed children and provide a path to success for them. “My mother got me out of the country. She saved my life,” chokes a woman, now a mother herself. It is 15 years later, but the pain has not ebbed. All of them talk about their dreams: to help their children who are in school, to support their aging parents, to become a citizen, to go to college, or just to talk to doctors and be able to shop for survival. We ask a lot of questions about work life and income, family composition and goals, and by the time the interview is over, we know a lot more than their score on a reading test. We know another member of our local community, a parent of a child in our schools, a worker at stores we frequent. They leave our office with a renewed spirit, knowing that someone in the United States, someone in Chester County, Pennsylvania, cares enough to help them. And that just might propel them through another few weeks until we find them a tutor. Last night I attended a Christmas concert at a local church, and in the handbell choir I saw the bright, shining face of one of our tutors, ringing away. 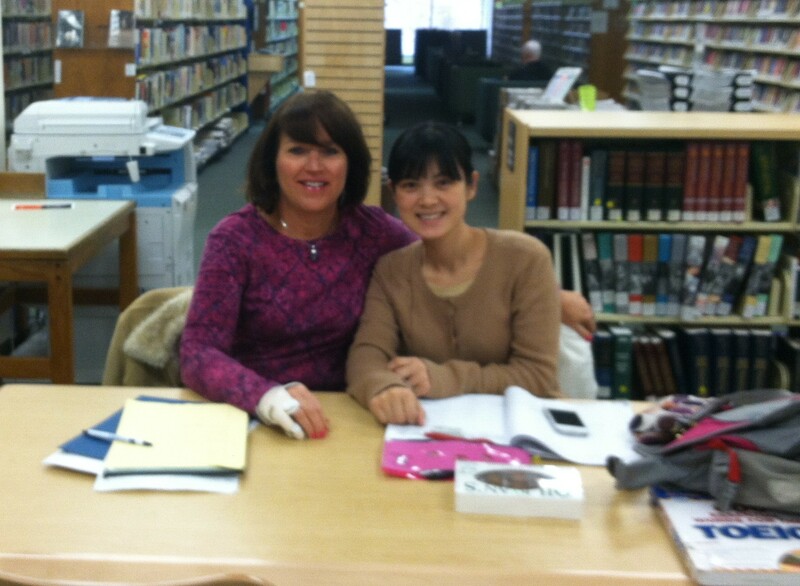 It struck me that I continually run into VEP tutors and students in various spots around Chester County. Yet, when I mention the Volunteer English Program, people often ask, “What’s that?” and inquire about our work. This is seldom a short interchange, as people are quite inspired and intrigued. As our Executive Director Terri Potrako says, we are “Chester County’s best kept secret.” (We are working on being better known!) We do not have an advertising budget; our word is spread by active volunteers and by vital community partners like libraries, churches, community organizations, and the media. VEP is actually everywhere around us. I go to the gym, and I am exercising next to several of our tutors. I think to myself, ‘that tutor is busy like I am, squeezing in a work-out before heading to the office, yet he gives his time to help someone.’ I push my grocery cart down the aisles of Shop Rite and spot tutors shopping for their family meals. My neighbor’s father was a volunteer with VEP for years. At the DMV, in the bookstore, at a restaurant… literally each week, I run into members of the VEP family. Wouldn’t you like to know who our tutors are? If you could spot them, like on a page of Where’s Waldo, you might be amazed at the reach and depth of volunteerism represented. It could be the person in the cubicle next to you at work, or riding the elevator with you, or dropping off her child at the same day care center. And THAT is often our best advertising: tutors tell acquaintances, neighbors, co-workers, friends and family about their transforming experience as a VEP volunteer. We do have almost 50 students waiting for a tutor, and we have a Tutor Training Workshop coming up in January (click here for details). If our story appeals to you, please consider signing up for training and working with an adult who needs to learn English. If you are already a tutor, please spread the word with the person next to you, and recruit someone you know. Our tutors and students (approximately 170) meet together all over the community in libraries, cafe’s, etc… They are out there, every day, probably somewhere very close to you, quietly carrying out our mission of teaching English to adult immigrants and refugees. And it is an inspiring and gratifying prospect to me, to know I live in a community where such an act is taking place, 170 times, twice per week. Won’t you make it 171?